The Supreme Court on Tuesday affirmed a three-year prison term for former President Park Geun-hye's friend for exerting inappropriate influence to get her daughter academic favors, the first final court verdict in a series of corruption trials in connection with a scandal that led to Park's ouster. 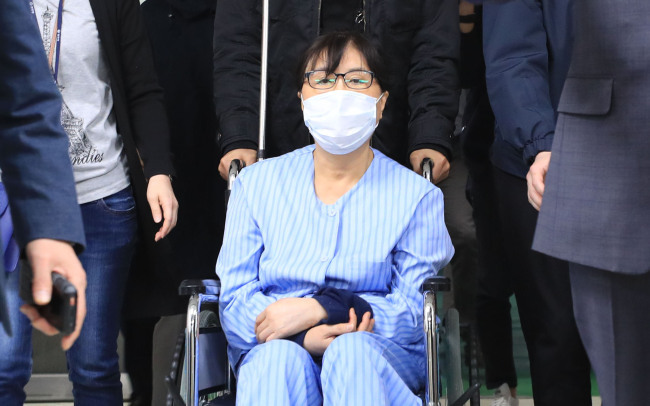 The top court upheld the appellate decision on Choi Soon-sil, a longtime confidante of Park, that found her guilty of colluding with officials from Ewha Womans University into giving her 22-year-old daughter Chung Yoo-ra special treatment for her admission and academic performance. Choi and several other university officials, including then-President Choi Kyung-hee, were indicted in 2016 on charges of obstruction of duty. Choi was accused of demanding professors give her equestrian child, grades for papers she never submitted and exams she never took, using her ties with the ex-president. In June last year, the lowest court handed down the guilty verdict for Choi, saying she committed "too much wrongdoing to consider her actions were out of love as a mother." The higher court in November ruled that she "ignored the law and legal procedures and betrayed trust over fairness," retaining the prison term for the defendant. The top court also finalized the two-year jail terms for the disgraced former Ewha president and another professor, Kim Kyoung-sook, for their involvement in the crime. Choi, who's been detained over the massive corruption scandal, will remain in the detention center instead of being transferred to a prison until her other appeals trial over the influence-peddling case reaches a verdict.